The personal journals of James “Jim” Modini were donated to Sonoma State University Library by Audubon Canyon Ranch in 2013. The journals, spanning 70 years, offer a vivid picture of life on a northern California sheep and cattle ranch during much of the 20th century and into the 21st. James Lawrence Modini Jr. (1917-2011) was born in Sonoma County, California and began working at the Pine Flat Road Ranch as a teenager. The land, which was in his family as far back as 1852, is near Healdsburg in the Mayacamas Mountain range. Eventually, Jim Modini inherited the ranch and he and his wife, Shirley, lived there from World War II until his death. Modini started his personal journals at age 18 and continued to chronicle ranch life until age 86. 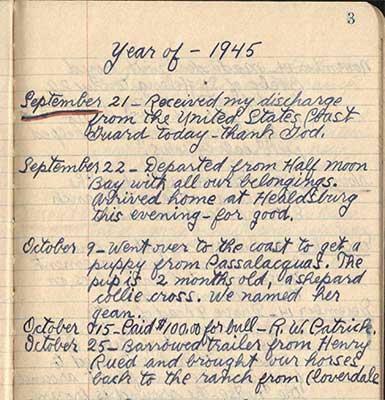 Journal entries include weather, prices, wildlife sightings, events, sketches, and musings. Jim and Shirley Modini’s fervent wish was to keep their 1,700 acre ranch wild forever. This was accomplished by working with the Sonoma County Agricultural Preservation and Open Space District to create an easement that protected it from development. In 2009, they donated the land to Audubon Canyon Ranch, an environmental organization that protects nature through land preservation, nature education and conservation science. Today, scientists are studying the diverse flora and fauna of the Modini Mayacamas Preserves, where over 90 species of birds are being monitored. Special Collections is scanning the Modini Ranch Journals and they will become part of North Bay Digital Collections in 2014. A generous contribution by Audubon Canyon Ranch is funding the digital project.